1. Map out Plan B. Figure out your next best flight options in case your plane is delayed or canceled. A simple online search at sites like Kayak.com or ITASoftware.com will give you a quick snapshot of available flights. That way you can suggest alternatives that you prefer rather than end up at the mercy of frazzled booking agents. Also, for $4.99 a month, OAG Flights2Go offers flight schedules and flight status information on your mobile phone. 2. Load up your cellphone with emergency numbers. In addition to the airline reservation line, include the number for the frequent flier representative if you are a member. Those booking agents tend to have more experience in looking for creative itineraries and may be helpful in finding an alternative flight. If you booked through a third-party travel site like Expedia or Travelocity, add its customer service line to your roster; it may be able to advocate on your behalf. 3. To make sure you’re not left out in the cold — or on the airport floor — when that snowstorm grounds all flights, add the numbers of some major hotel chains, like Starwood or Marriott, with airport locations. If you are an iPhone user, there are several free apps that offer nearby real-time hotel listings with available rooms, including HotelPal, Hotels.com and Kayak.com. 4. Set up a flight alert for yourself and anyone who may need to know your whereabouts, like the aunt who offered to pick you up at the airport. These services, offered by most airlines and Web sites like Flightstats.com, let travelers know if a gate or flight time has changed via e-mail or text message. Orbitz.com allows customers to alert up to six people at a time. Knowing about such changes early can give you an edge over the 100-plus other passengers on your plane if there is a cancellation and you need to alter your plans. Another tip: iPhone users can download the FlightTrack or Flight Status app, which offer the status of thousands of flights, as well as arrival gates and baggage carousels, for a one-time $4.99 fee from Apple’s iTunes App Store. 5. Pack smart. Leave the shower gel or anything else you can pick up at your destination. Have gifts shipped ahead so you don’t have to lug them with you. Edit your wardrobe: do you really need three sets of heels for dinner at Grandma’s or will one pair do? A carry-on will also allow you to avoid the scrum at baggage claim and easily move between flights if your itinerary is wrecked by delays. If you must check luggage, you can save $5 at most airlines by prepaying online. (Many airlines now charge $15 to $25 for the first checked bag and $25 to $35 for the second on domestic flights.) United passengers can also pay a $249 annual fee to check up to two bags on each flight, and avoid paying the usual fees. 6. Know your rights. 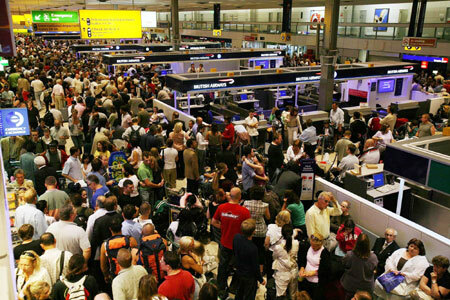 This is critical during busy travel periods when flights are often overbooked and confusion reigns. Travelers can receive up to $400 if they are involuntarily bumped and rebooked on another flight within two hours after their original domestic flight time and within four hours for international flights. They are eligible for up to $800 in cash if they are not rerouted by then. Complaints about airline service other than safety or security issues may be registered with the Department of Transportation’s Aviation Consumer Protection Division . 7. Check in ahead of time online. This may be common sense, but it’s important to arrive at the airport with boarding pass in hand because the last travelers to check in are often the first to be bumped when a flight is oversold. Most airlines allow travelers to check in online as much as 24 hours in advance. 8. Reserve a parking spot. Holidays are also crunch time at airport parking lots, where the best spots fill up fast. You can avoid circling the airport in search of a space by reserving a parking spots at off-airport lots, which offer shuttles to the airport. Services like Park ’n Fly Network and AirportParkingReservations.com allow travelers to search for and reserve a spot by plugging in their departure airport and travel dates. Rates start at about $6 a day, but vary by airport. 9. Know your airport. If your flight is delayed, you may end up spending a lot of time there. Airport Maps, a $2.99 app for the iPhone, shows where gates, airline lounges, restaurants and shops are at more than 60 major North American airports, so you can easily pick up some last-minute gifts at the duty-free store. Another app, iFly Pro, offers details on 350 commercial airports for $6.99. This entry was posted on December 22, 2009 at 9:00 am and is filed under Airlines, Frequent Flyer, Travel. You can follow any responses to this entry through the RSS 2.0 feed. You can leave a response, or trackback from your own site.